This article is part of the column, Canada’s First Peoples, by Hans Tammemagi, which appears regularly on Roadstories around the middle and end of each month. The column focuses on Canada’s aboriginal peoples and their rich culture. Topped by a towering totem pole and a traditional bighouse, Vancouver’s Skwachàys Lodge is a most unusual hotel. 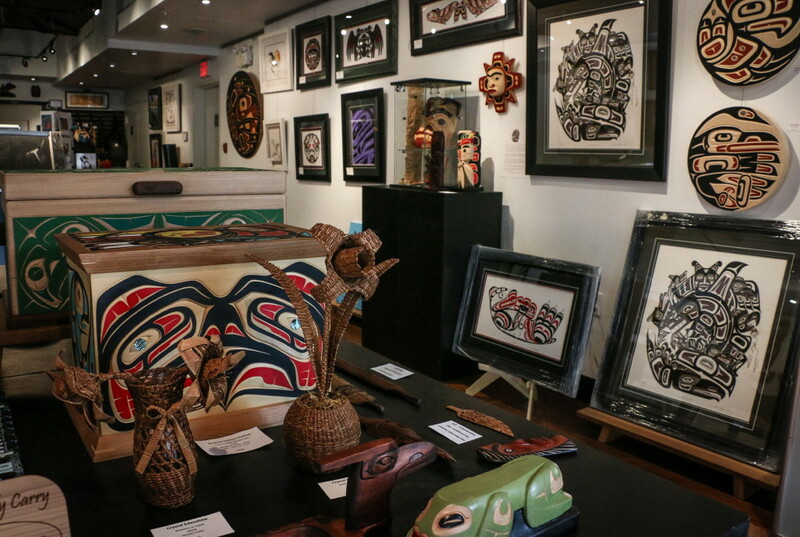 The lobby is a Native art gallery bursting with carvings, masks, paintings and jewelry. 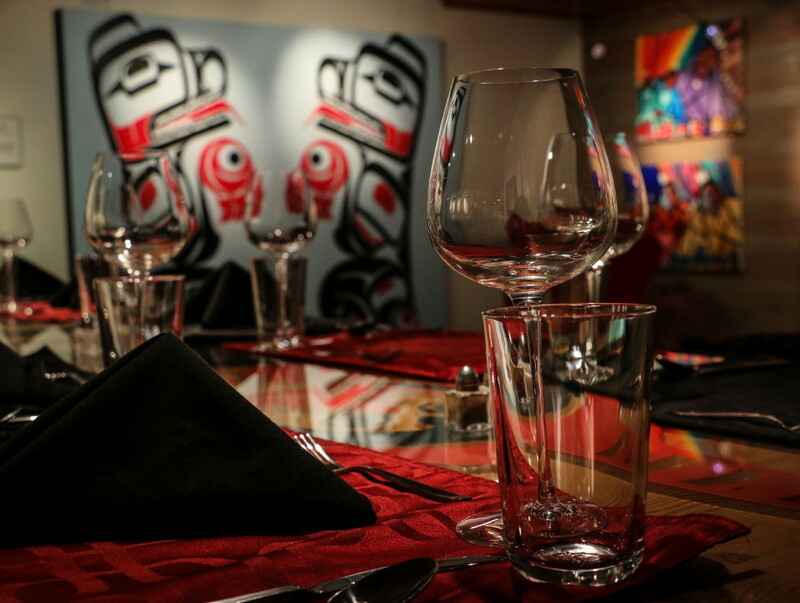 The adjoining Welcome Room has dozens of unique aboriginal art pieces including a bold mural and an imposing carved communal table. 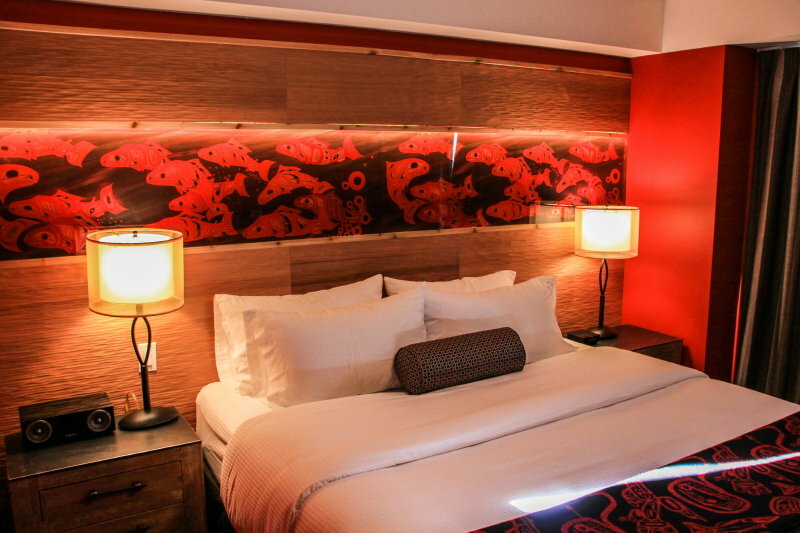 Each of the 18 hotel rooms is decorated in elegant indigenous themes, created by Native artists working with top designers. A sweat lodge used for spiritual cleansing is on the roof beside a waterfall, totem pole, and a mural of a mountainside. In an adjoining room, traditional smudge ceremonies are performed by an Elder, who burns sage in a large oyster shell. 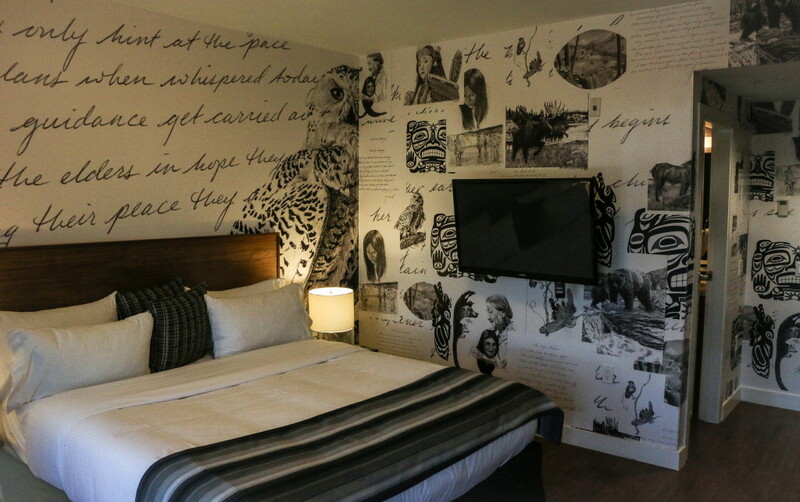 No other hotel in Canada is so steeped in aboriginality. The Lodge, which opened in October, 2014, is located on the edge of the gritty Downtown Eastside of Vancouver, the roughest neighbourhood in British Columbia. The Eastside overflows with homeless people, drugs, addictions, mental problems, petty crime and, most of all, hopelessness. A disproportionate number of these people are Natives, which is why Skwachàys (pronounced Skwatch-eyes) Lodge is important. The Lodge is not only a showcase for Native culture, but also a residence and training school for Native artists, many of whom would otherwise be at risk of homelessness. There are 24 studio apartments for artists and all the profit from the hotel and the art gallery goes to subsidizing them. 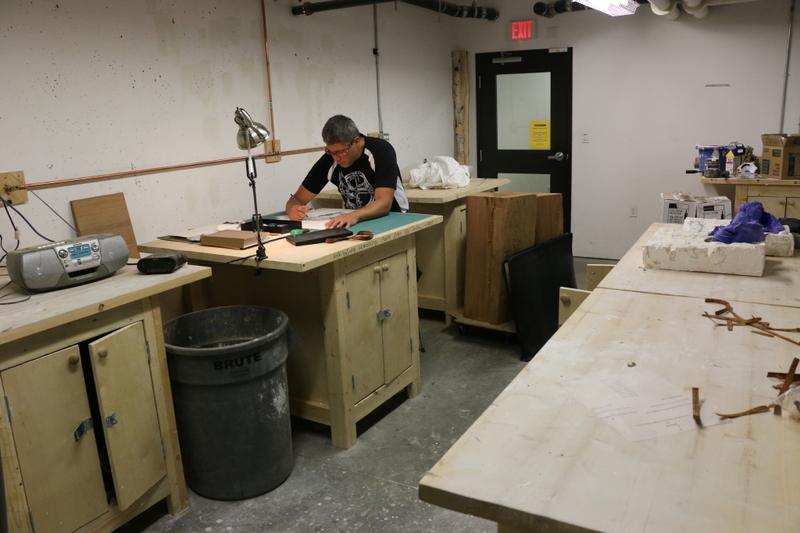 A large basement workshop provides space for carving and painting. The hotel offers the residents an opportunity to make and sell their art, develop a career and earn income. Once selected, residents can stay for two years. Clifton Fred in basement workshop. 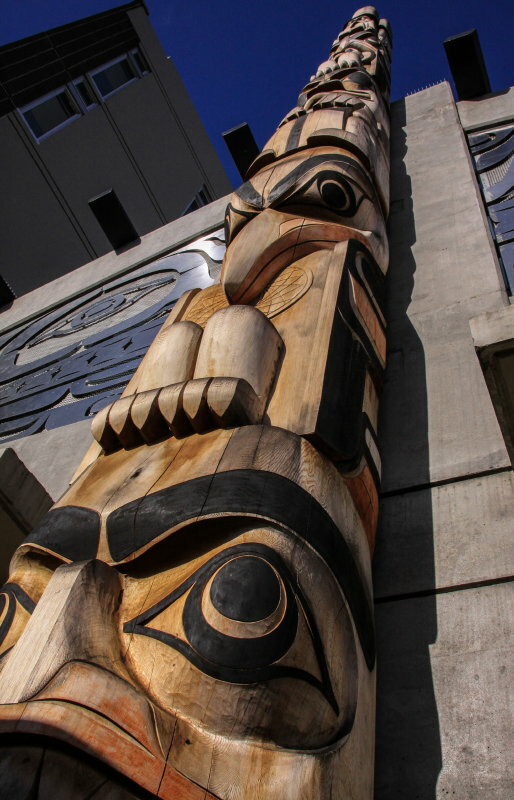 “This is an important project,” said Dave Eddy, a driving force behind the resident-artists concept and the president of the Vancouver Native Housing Society, which owns the Lodge. “We are providing housing relief for a traditionally impoverished segment of the population, but, more significantly, we are also helping them forge careers and stand on their own feet.” It’s a unique symbiosis of boutique hotel, cultural centre, low-income housing and art school — a social enterprise unique in North America. There are twenty-four residents (13 men, 11 women) consisting of carvers, painters, actors, jewelry makers, sculptors, film makers, dance performers and musicians. All are emerging artists struggling to become established. But it’s difficult, for most of the artists are missing the necessary marketing skills. Clifton Fred of the Tlingit First Nation in the Yukon was one of the first residents at the Lodge (he has now “graduated”). He works in pencil drawings and poetry, an unusual combination. His art decorates three guest rooms and his work sells in the lobby gallery. 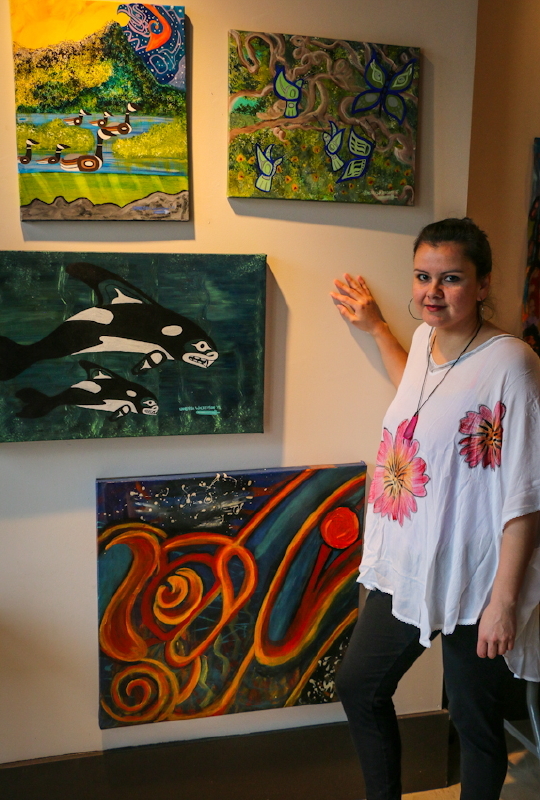 Vanessa Walterson, a Cree from Manitoba who started painting four years ago, became a resident a few months ago. “Skwachàys has enormous potential,” she said. At first she was lonely but monthly meet-and-greets along with a welcome by an Elder has changed everything, and now she is actively involved. Walterson led me into the Eastside along streets dotted with the homeless and desperate. We reached Ravens Eye, a Native housing unit and entered a high-ceilinged gallery. Walterson proudly pointed to four colourful acrylic paintings, “Some of my work is already selling. My long-term goal is to become so well known that I can hold shows in other cities.” This won’t be easy, however, for she has no website, business card nor brochures. And she has few connections in the art world. To address such concerns, seminars are being started at Skwachàys. One course will address entrepreneurship and business skills. Participants will be eligible to receive additional support for promotion development, website support and business card design. A prerequisite will be a basic financial literacy course. In addition, monthly meetings will teach how to complete grant applications and will discuss what funding programs and professional development are available for residents. A monthly newsletter is being initiated that will list coming arts events as well as artists’ opportunities, especially those focused on First Nations culture. Talking Circles will be held weekly with an Elder present. A Women’s Circle will meet monthly with an Elder present. “We don’t have much of a budget,” said Hunter, “so we’re looking for creative ways to raise money. For example, workshops are being developed where residents will give lessons to hotel guests on how to carve, paint and make jewelry. Initiatives for making Skwachàys a recognized and respected art centre, such as encouraging established artists to visit, make presentations and put on shows in the Gallery, are being explored. Skwachàys Lodge has taken a bold step. Let’s hope others follow. 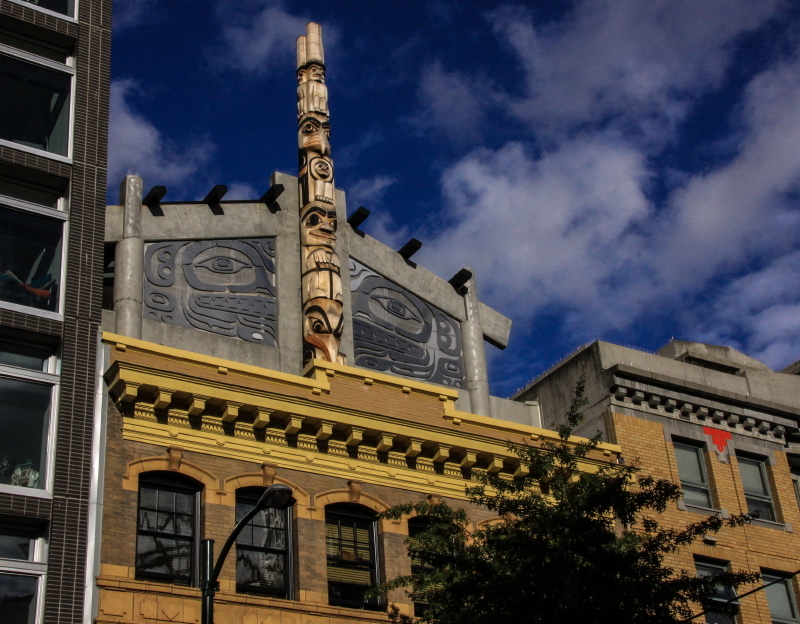 Dreamweaver Pole at Skwachàys Lodge on the edge of Vancouver’s Downtown Eastside – all images by Hans Tammemagi.